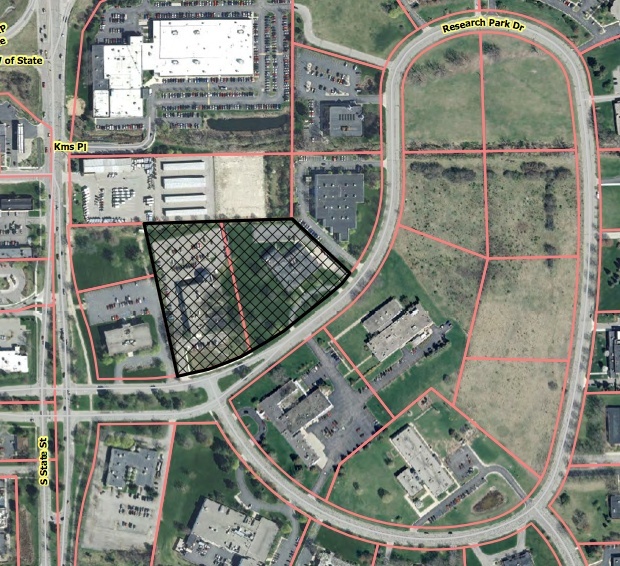 A $10.5 million expansion of the Gift of Life Michigan facility on Research Park Drive is moving forward, following a recommendation of approval from the Ann Arbor planning commission at its July 1, 2014 meeting. Commissioners unanimously recommended approval of rezoning and a site plan for the project. Aerial view of Gift of Life Michigan site. The proposal calls for building a three-story, 40,786-square-foot addition to connect two existing buildings at 3161 and 3169 Research Park Drive, which are owned and occupied by the nonprofit. According to a staff report, the additional space will accommodate offices, a special events auditorium and “organ procurement suites.” The nonprofit’s website states that the Gift of Life is Michigan’s only federally designated organ and tissue recovery program. The proposal includes a request to rezone the properties from office (O) and research (RE) to office/research/limited industrial (ORL). The parcel at 3161 Research Park Drive is currently zoned O. The parcel at 3169 Research Park is zoned RE. The plan is to combine those lots before the city issues building permits. The project would reduce the four existing curb cuts to Research Park Drive to three, connecting one of the loop driveways to an existing driveway at the east end of the site. A parking lot at the back of the site will be expanded by 38 parking spaces. Two alternate vehicle fueling stations are proposed in parking spaces near the main entry, with the driveway at the center of the site providing access for ambulances. A new shipping and receiving facility will be located on the northeast corner of the site. With a recommendation of approval, the rezoning, site plan and development agreement will be forwarded to the city council for consideration.